But how does the Son of God end up wearing a crown of thorns and nailed to a tree? In the earlier parts of the Gospels we see Jesus healing the sick, feeding the hungry, raising the dead, and forgiving sinners. How do these beautiful miracles in Galilee lead to the ugly brutality of Good Friday? The failure to adequately address this question is the failing of most Jesus films. These movies offer little to explain how the preacher of the Sermon on the Mount ends up condemned by the Sanhedrin and executed by the Roman Empire. But the answer is right there in the Gospels. Jesus was not preaching his sermons and working his miracles as “random acts of kindness” but as announcements and enactments of the arrival of the kingdom of God. By the kingdom of God we mean the government of God, the politics of God, the alternative arrangement of the world that comes from God. In his practice of radical hospitality Jesus was announcing the arrival of a new way of arranging human society. Jesus was proclaiming to the principalities and powers (the very rich, the very powerful, the very religious, the institutions they represent, and the malevolent spirits that energize it all) that their time was up because the alternative from heaven was now within reach. The empire always strikes back. At the cross the sin of the world coalesced into a singularity where it was both borne and forgiven by God in Christ. The structures of sin (“the sin of the world”) that entangles and implicates all of us reached its hideous apex in the crucifixion of the Son of God. At Golgotha the sin of the world gathered in a Good Friday singularity where it was absorbed and forgiven and thus dispelled. When Paul speaks of Christ being made sin, all we have to do is to look at a crucifix to understand this is true. What could be a greater sin? What could be a greater crime? No crime can be greater than the crime of deicide — the murder of God. And that’s what we see when we look upon the cross; we see the sin of the world coalesced into a single event — the killing of the Innocent One. 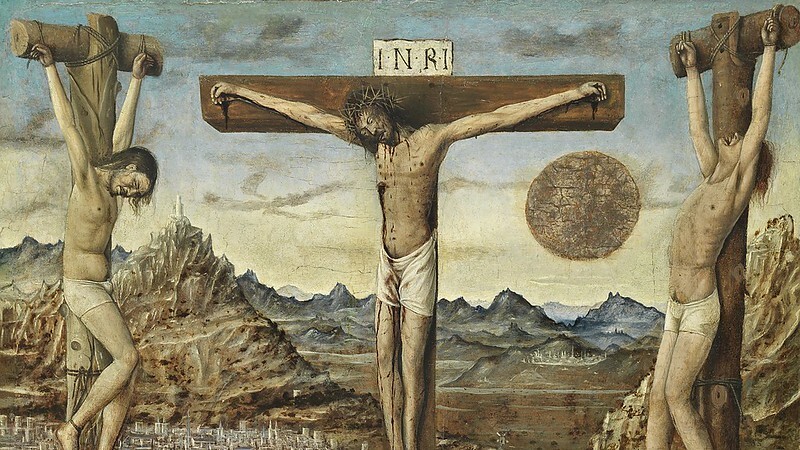 On Good Friday all the disparate sins of the world amalgamate into the sin of the world. Whether flowing forward in time or backward in time, every human sin, every act of selfishness, every debasing degradation coalesces in an awful singularity at the cross. What is the sin of the world? It is Jesus nailed to a tree. This is why on one level the crucifixion will always remain ugly — it is the image of all sin coalesced into a single event. But that’s not all the cross is. The cross is also beautiful. The cross is both the awful crescendo of human sin and the sublime apex of divine grace. The cross is beautiful because it is the place where sin as a singularity is absorbed, forgiven, and transformed into reconciliation. This is the beauty that saves the world. And it’s the light of Easter shining upon the cross that reveals this beauty. But if we rush past Good Friday we miss it all. 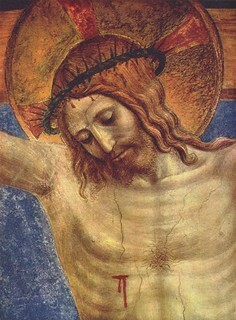 As we approach Good Friday let us slow down and behold the Lamb of God who takes away the sin of the world.